Written by Dr. E.C. Fitch, the book contains over 340 double column pages which include 400 figures and tables, a comprehensive bibliography, and index. There is no root cause of mechanical failure, known to the author, that has been ignored or left out. Nowhere in the world is this information put together in such a concise and comprehensive manner, and the book will serve as a reference and guide to designers, practising engineers, maintenance technicians, plant managers and operators who must design, maintain and operate fluid–dependent mechanical systems. Maintenance Technology. Machine failure. Maintenance strategies. Preventive maintenance. 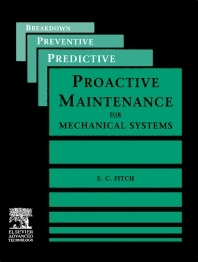 Predictive maintenance. Proactive maintenance. Root causes of failure. Contamination Stability. Contaminants. Material contaminants. Contaminant analysis. Contaminant exclusion stability. Fluid filtration stability. Contaminant level reference state. Component contaminant stability. Leakage Stability. Leakage. Leakage recognition. Leakage sources. External leakage sites. Internal leakage sites. Fluid Chemical Stability. fluid stability. Stability indicators. Oxidation stability. Hydrolytic stability. Material stability. Anti–rust/corrosion stability. Radiation stability. Thermal stability. Lubricity stability. Antiwear stability. Infrared spectral stability. Fluid Physical Stability. Physical properties. Viscosity stability. Bulk modulus. Density/specific gravity stability. Surface tension stability. Vapor pressure/volatility stability. Aeration stability. Water content stability. Low temperature stability. Obliteration stability. Dielectric stability. Heat transfer stability. Particle contaminant stability. Flammability stability. Toxicity. Cavitation Stability. Cavitation mechanics. Gaseous cavitation. Vaporous cavitation. Cavitation overview. Reservoir design technology. Suction line hydraulics. Control valves effects. Cavitation in actuators. Cavitation in other components. Cavitation damage. Cavitation inception. Temperature Stability. Temperature extremes. Low temperature effects. High temperature effects. Cause of overheating. Cures for overheating. Heat dissipation. High temperature overview. Wear Stability. Tribological wear. Abrasion wear. Adhesion wear. Surface fatigue wear. Delamination wear. Fretting wear. Erosion wear. Cavitation wear. Hydrogen–induced wear. Electrokinetic wear. Radiation wear. Mechanical Stability. Stability factors. Mechanical static loads. Mechanical dynamic loads. Elastic deflection. Elastic buckling. Plastic deformation. Material creep. Material fracture. Fatigue fracture. Material failure. Component failures. The Proactive Approach. Maintenance strategies. System monitoring. Duty cycle severity. Conditional failure identification. Knowledge–based maintenance. System diagnosis. Fluid system diagnosis. System prognosis. Prescriptive action. Weak points of system. Proactive vs reactive. Getting started. Rewards of proactive maintenance.